This power steering hose kit is just what you need to plumb your drivers side remote reservoir power steering set up. 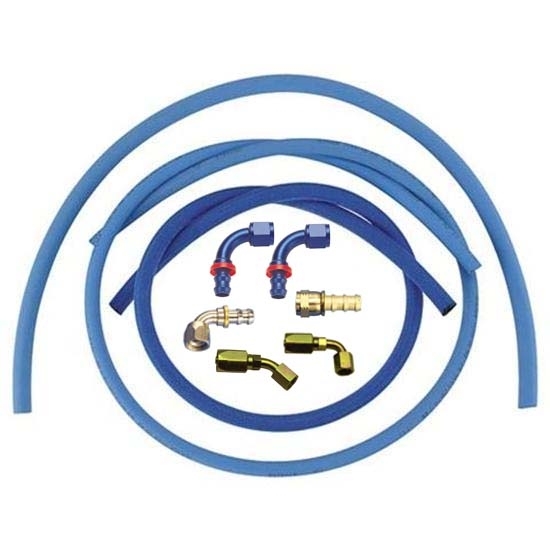 The AN 10 hose kit includes 4 of AN 6 high pressure hose, 5 of AN 6 blue aeroquip hose and 3 of AN 10 blue aeroquip hose One 45° AN 6 and one 90° AN 6 fittings are included as well as an AN 6 straight brass push-on and one AN 6 and two AN 10 90° push-on hose ends. AN 6 pressure and return and AN 10 reservoir and fittings. Aeroquip FBG0600 FC300 High Pressure Hose, -6 AN, 6 ft.